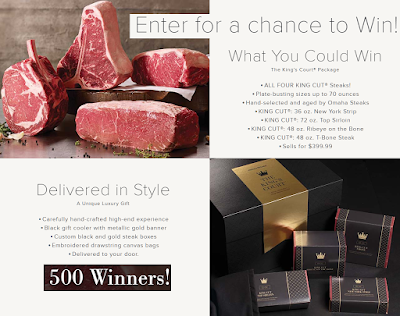 Omaha Steaks huge King Court Prize Pack Giveaway - 500 Winners Each Win a $400 Prize Pack With Four King Cut Steaks: New York Strip, Top Sirloin, Ribeye on the Bone and T-Bone Steak. Limit One Entry Per Day, Ends 6/17/18. WOW!!!! Will definitely be the best meal you have ever had. I'm sure we will have a bunch of winners from here, we had many in this contest last year. Enter daily and GOOD LUCK! !